Rapping on the J-type's door? One of the least 'posh' Andersons, this subtly downsized 'J' is Tom's favourite. Play one you'll find out why. An Anderson with attitude. Wonderful tones. Excellent intonation and tuning stability. Tom Anderson guitars and their modern aesthetic might not be your idea of 'cool', but very few guitar players would deny the quality of build, playability and sound. Does electric guitar making get any better? Well, to put that to the test we look at a new yet familiar design, the Raven, introduced in 2013. 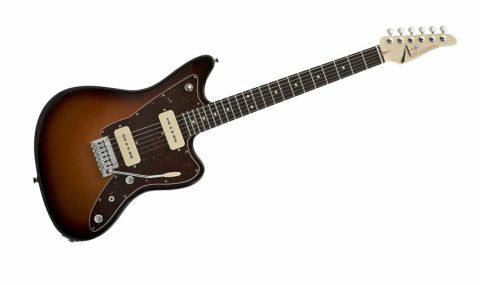 "Here the classic body outline is downsized and while it retains the large scratchplate, it's actually very un-Jazz-like. It's also very lightweight"
Tom Anderson certainly isn't the first maker to use the Fender Jazzmaster as inspiration. Here the body outline is downsized and while it retains the large scratchplate, it's actually very un-Jazz-like. It's also very lightweight, weighing in at just 3.13kg (6.89lb). While you can order the Raven with the shorter, more traditional 629mm (24.75-inch) scale, our example comes with a 648mm (25.5") scale length. Previously known as the 'standard' neck profile, the now- called 'even taper' neck is beautifully shaped, a good full C-section that doesn't taper a great deal from its 1st fret depth of 21mm to its 22.6mm depth at the 12th. The 'board has a pretty subtle compound radius that starts, Gibson-like, at 305mm (12 inches) at the nut and flattens out slightly to 356mm (14 inches) by the top, 22nd fret. Sure, if you can't play anything else but a vintage Fender-like 184mm (7.25-inch) radius you're going to find this too flat, but most of us won't be thinking about the radius because our fingers will be skipping over the finely fettled medium gauge stainless steel frets at such a speed that the only thing you'll be considering is how can you afford to buy one. Set up is low and slinky (around 1.3mm on the treble at the 12th fret, through 1.6mm on the bass-side, with the barest hint of relief ), but where so many guitars would struggle - and we'd struggle to play them - every note rings out perfectly with enough height to the fret to dig in without it feeling over-tall or too big. It's astonishing, not least the fret work, which is much tougher to do on these harder stainless steel frets. Even under a magnifying loupe it's hard to see any abrasion marks - each fret end is perfectly domed, almost like a signature, and the fingerboard edges are just slightly rolled to give a played-in feel. This same attention to detail pervades the rest of the instrument. On the super smooth vintage-style vibrato, the E and A string tuners have higher posts than the other four and an over-tall string tree on the top two strings means that all six exit the nicely cut nut at pretty much the same angle. Tuning issues? Don't be silly. On first look, the pickups appear to be standard soapbar P-90s, which also don't look a million miles away from the original Jazzmaster units. However, they are in fact humbuckers: the PQ1 (neck) and PQ2 (bridge) - "the Q stands for quiet!" states Anderson. Height adjustment is sorted with a screw at each end for treble to bass height and a third screw that allows you to tilt the pickups to match the angle of the strings over the body. These are simply controlled by a shoulder-placed three-way toggle selector switch, master volume and tone. The mini-switch here is a two-way, which simply engages that passive mid-boost in the down position. Anderson has been one of the most vocal supporters of Buzz Feiten and his 'sweetened' tuning system, which is featured on all Anderson guitars, including this one. It's yet another detail that adds to the superb intonation and musicality of this guitar. "You have the sense that the P-90 has been cleaned-up a little, the razor-like highs of the bridge especially are tamed, less ear-wearing"
The Raven is a simple drive. We hear a more rounded high-end compared with either our old Gibson Les Paul Junior or more modern Yamaha and PRS soapbar-equipped instruments. Anderson's single coil-sized humbuckers already blur the boundaries between traditional single coils and humbuckers and this, of course, is the area in which the P-90 excels. You have the sense that the P-90 has been cleaned-up a little, the razor-like highs of the bridge especially are tamed, less ear-wearing, and the guitar's construction yields less weight in the mids and low-end compared to our all-mahogany original Junior. But as we turn up the wick there's definitely the essence of the P-90's voice: tougher than a classic single coil but not as sophisticated as a full-size humbucker. Here, though, there's zero hum. The VA boost sounds more polite here than on the Classic, in fact it's less of a boost more of a single coil/humbucker-like mode switch. As we play the Raven more we lean towards a more alt-rock place. Those just crunchy tones sound superb and kicking in effects and boosts, well, the Raven sounds really at home. An Anderson with attitude? Not what you expect perhaps from a 'posh' brand, but it's what we hear. In spades.